Our Lee’s Summit location is at 605 NW Murray Road, Lee’s Summit MO 64081. This location is across the street from a very busy shopping center making the Lee’s Summit center close to all of your everyday errands. From 1-470, take 50 Hwy towards Lee’s Summit and immediately exit at Chipman Road. We are in the strip center with Houlihans. The staff at Lee’s Summit are top notch and go above and beyond for their clients . They make the journey of losing weight and staying on the program easy and enjoyable. They love to share creative ways to utilize our protein snacks. Every successful client we have tells their friends, family and coworkers and that is why we have such a growing business. Your time is now, call Lee’s Summit today. 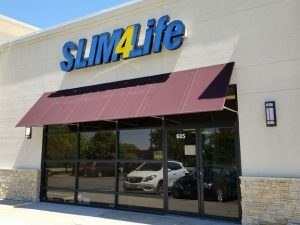 Make an appointment at our Lee’s Summit weight loss center today!